ST. GEORGE — Three organizations are teaming up this Thursday to host the “Community Volunteer Fair” to connect volunteers and organizations in need in Southern Utah. More than 40 nonprofit, faith-based, community and government organizations will share their volunteer and donation needs. Everyone is encouraged to attend to learn how they can serve in the community or adopt an organization they feel passionate about. “Volunteering strengthens the community we live in by supporting organizations who need hands and hearts to further their causes,” Dixie Serves volunteer coordinator Karyn Wright said in a press release. The event will be held from 6:30-8:30 p.m. in Dixie State University’s North Plaza. 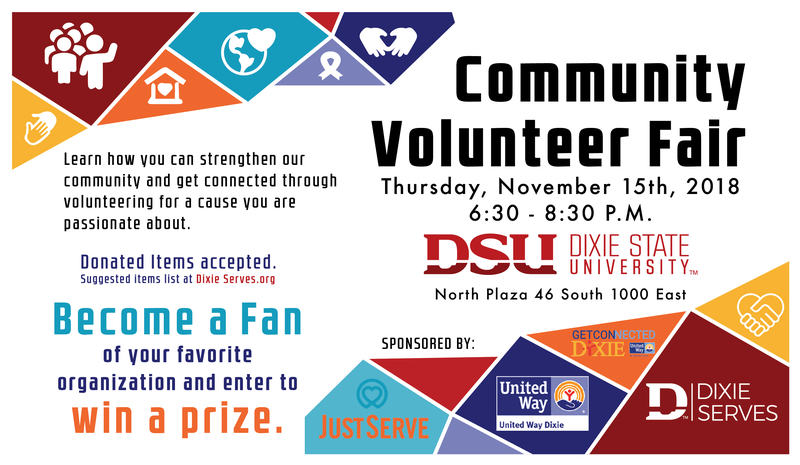 Dixie Serves, housed on the Dixie State campus, connects the community and university with meaningful volunteer opportunities on and off campus. JustServe, a service provided by The Church of Jesus Christ of Latter-day Saints, is a website that posts organizations’ volunteer needs to help individuals connect with places to serve in the community. United Way Dixie, one of nearly 1,800 branches of United Way Worldwide, connects the Washington County community with volunteer opportunities focusing on education, financial stability and health. Where: Dixie State University North Plaza, 46 S. 1000 East Street, St. George. Details: Learn more at the Dixie Serves website. Doctors' Volunteer Clinic is all about hope. This is where people in need can get help for physical and mental health. Sounds interesting. Seems like a list of the organizations that will be there might be helpful though. If I have some time that day I will stop in.